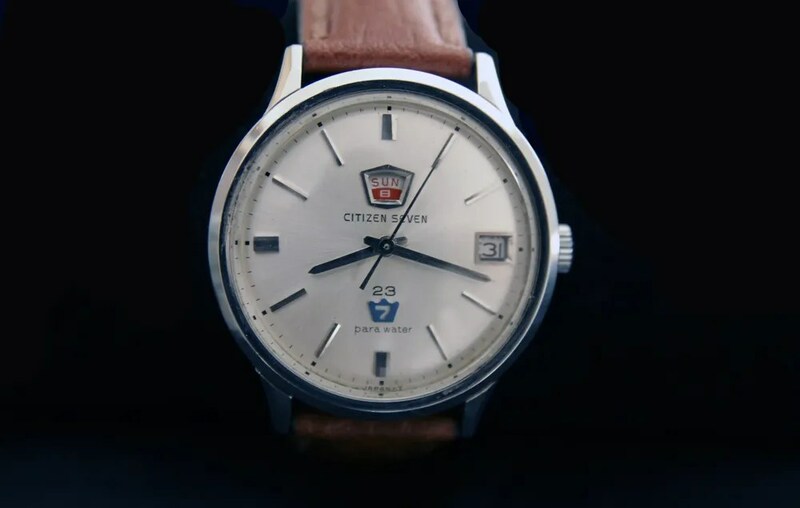 I thought after last week’s Crystal Seven, and my mention of the ‘Seven’ name being used on autodaters and a hand winding watch, that I’d follow this week with that hand winding model. 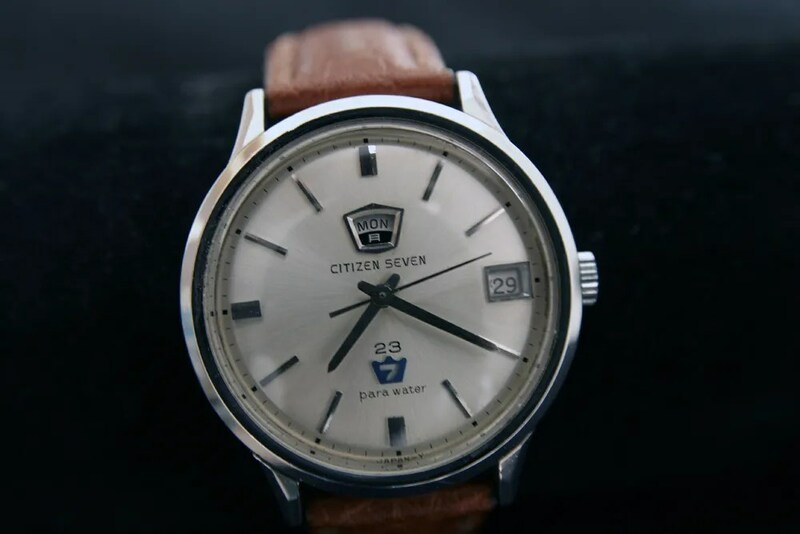 Rather than ‘seven’ being part of the model name, this one is uniquely called the ‘Citizen Seven’. 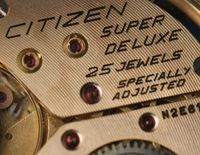 First produced in 1964, the Seven uses the 4000 movement, only seen in this model and one other – the Young Date – with 23 jewels. Made in April 1966, the back is marked with an ‘X’ – this may refer to this being a front opening case. As a result I can’t post a picture of the movement in this one. The day is a ‘semi’ quickset by winding back and forth between 12 and 9, whilst the quickset date is changed by pulling the crown in and out at the second click. This also means that the hands are moved by pulling the crown out just one click. The downside to this design is that it is possible to accidentally advance the date if you want to adjust the hands and pull the crown out a little too vigorously! The crystal is thick glass, and all models are rated at 40m water resistance, and run at 18,000 beats per hour. When new these (at least the model shown in the book) cost nearly JPY9,000. 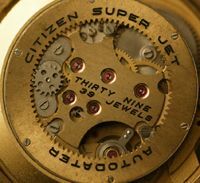 This entry was posted in Vintage Watches and tagged Citizen Seven. Bookmark the permalink. I wanted to ask you, how to determine the date of issue of super-king (jet rotor)? Hi Sergei, thanks for your comments, and it’s good to hear that you have started to collect vintage Citizens 🙂 I’m afraid that your model doesn’t have a serial number (unless it’s stamped inside the case back) so it’s not possible to determine the exact production date. We can get an approximate one, since these use the 25 jewel 41xx movements, which were first produced in 1964. Since the jet rotor was being replaced by the swinging weight type soon after that, I would think your watch was made between 1964 and about 1967. The Super-kings were export models as far as I know, so I would think they might have been made a little while after the initial models in Japan, so 1966 / 1967 is probably a good guess! say whether the presence of labels on the calendar only in English that is the watch made ​​for export? Hi Sergei, it’s partly because the day is in English only, but also because it is marked ‘waterprooof’ (rather than ‘parawater’). And also the ‘Superking’ name was used for watches with different movements, the jet one like yours and the later swinging weight type. As far as I know this didn’t happen with models made for the Japanese domestic market at the time. As far as I can remember I’ve only seen Superking models for sale outside Japan, which also suggests it was an export model. And with the inscription paravater and kanji on the calendar may say that the watch for the internal market? Hi! I’ve just got a vintage Citizen. It seem to be a Crystal Seven. Can you please give me more infomation about my watch? Hi hackie7686, I’m afraid the link to your pic is not working so I haven’t been able to look at your watch. From the information you’ve given, it sounds like your watch is an ‘Eagle 7’, with the 8200 automatic movement. 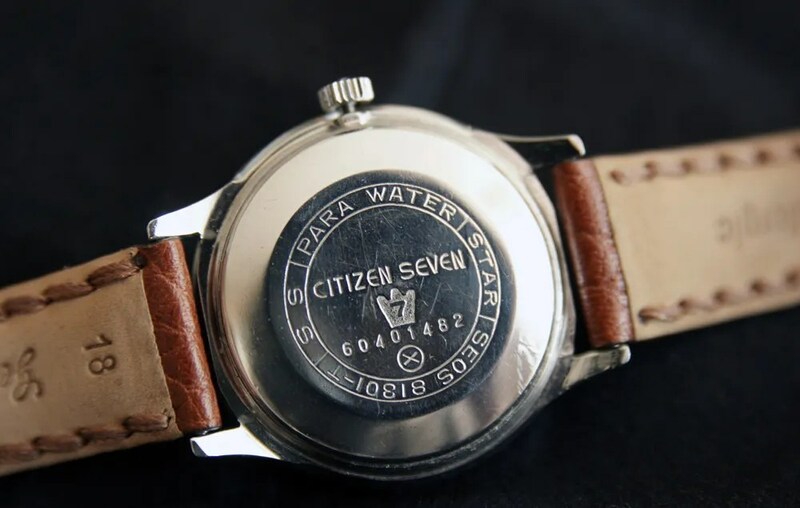 These are later than the Crystal Sevens which would be marked ‘parawater’ or ‘waterproof’ rather than ‘resistant’. Does the dial have an eagle logo on it, and is it marked 21 jewels? 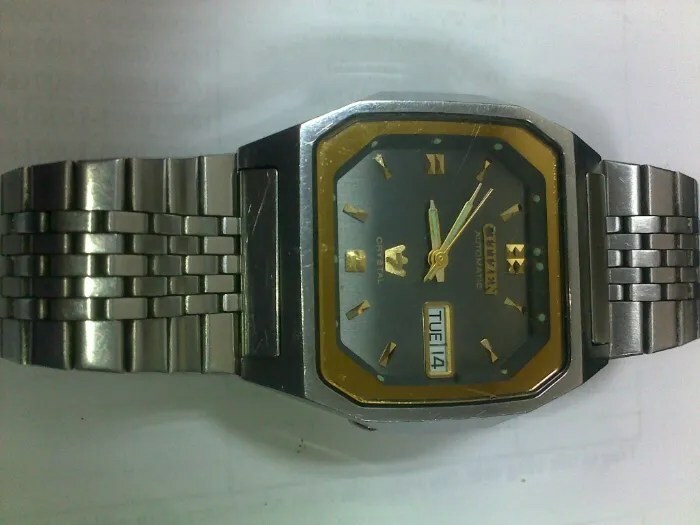 If so it definitely has the 8200 movement and is most likely from November 1982 (from the first 3 digits in the serial number – 21102949). 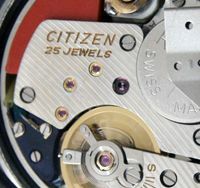 This movement has been used by Citizen in its base automatics since the mid-1970s and if in good condition is a reliable and accurate calibre. I think it’s from 1982 rather than later than that because it has an eight digit serial number – later ones are often 7 or 6 digits. If you could try and link to a photo again I can have a look at it. The logo on the dial looks like a crown with a “7” in the middle and the text “Crystal” is under the crown. 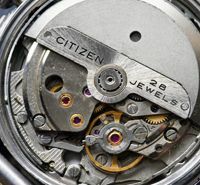 I can’t see any infomation about the number of jewels but in a document i’ve found about all the Citizen vintage movement, the Miyota 8200 has 21 jewels and 21,600 beat per hour. I’ve just receiveed it and I’m testing the accuracy of the movement. Hi – I’m afraid the second link isn’t working, so I have sent e-mail. 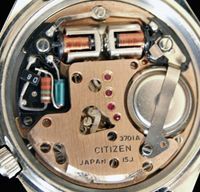 The information you’ve found about the 8200 movement is correct, it was also one of the first of Citizen’s movements to use a rotor that wound in one direction only. Hi Stephen! I’ve just sent you an email. I hope you can see the pictures of my watch. Hope to see you soon with another Citizen watch. Maybe you can help me with some informations about the 4xxx movements. I’ve got a handwind Seven. Not like yours with the monocoque case, more similar like the one from your catalogue print. Other than your Seven, mine has no date quick set. I didn’t open the snap on case back as it runs almost like a quartz and has a 48h power reserve. Do you know what the last digit on the caliber means (400x or 411x or 410x)? Do they have date quick set or not depending on that last digit? Another question is about the period when the jet rotor automatic calibers were build. Personally I have never seen a later model with jet rotor than 1965. Are you sure these calibers were still build after the introduction of the 5000 family in 1965? Thanks for answering in advance and best regards! Hi Markus, good to hear from you 🙂 Since the Seven has both day and date complications, then it should have the ‘easy change’ (EC) system for the date. Otherwise I don’t see how the day and date can be synchronised properly when you want to set them. Does the crown pull out to a second step at all? The text in the ‘museum’ book entry for the Seven refers to the ‘EC’ system. Yours sounds to be running great and a 48 hour reserve is very impressive. I don’t think the final digit in the movement number refers to quick setting since different numbers relate to day and date models. I’ve just checked my reference material and the models I’ve found so far with production later than 1965 are all Super Jets – so it may be only the higher grade models continued for a little while after 1965. The latest I’ve seen is a rare Super Precision model from 1967. Firstly, congratulations on your great web-site and blog. I was inspired by your article on the Citizen Seven Day Date manual wind watch to add one of these to my collection. I recently managed to find one on EBay and was fortunate enough to buy it. 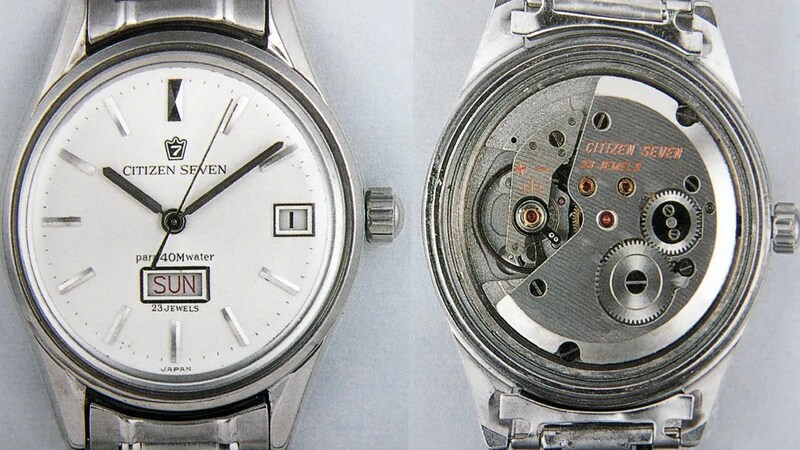 It appears that the watch was manufactured in October 1965 with the case number being 51000295. The case and original band are gold plated. The case is a one piece design and the movement is the 4001 model. Hi Brian, thank you for your kind comments, they are much appreciated 🙂 The ‘Seven’ is not often seen so congratulations on finding one. 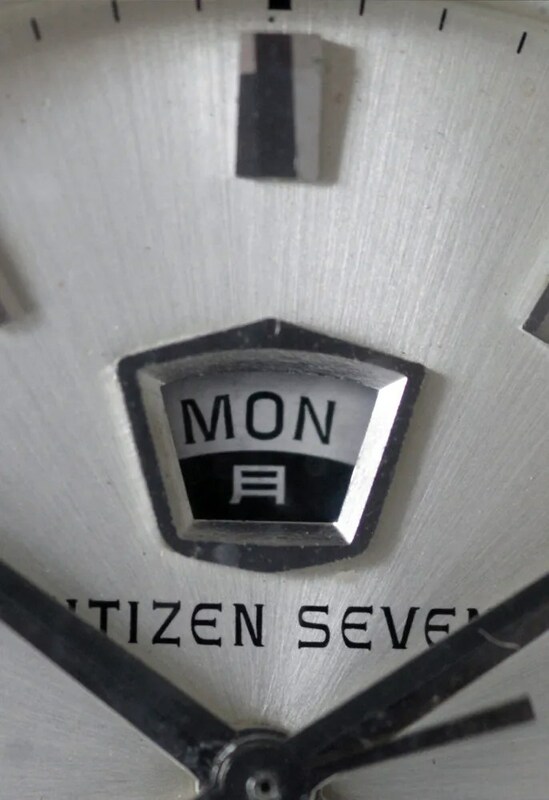 Here is the link to some photos of my Citizen Seven.